Purpose of activity: To learn how invertebrates are classified. The phyla are represented as flaps, so the alliteration (think of them as Phylum Phlaps?) helps to reinforce which words are the names of phyla. It can get very confusing and this chart helps to simplify things by giving a strong visual memory of the flaps. Under each flap are the subcategories and examples of the animals on those phyla. The students will be surprised at how large/small some of the phyla are. Some worms have a phyla all to themselves! Other phyla contains thousands, if not millions, of animals. Description of activity: The students assemble two lift-the-flaps charts. The flaps must be cut with an X-acto knife or razor blade. Adult help will be necessary for younger children. I pre-cut all the flaps for my elementary classes. This is a good reference for students of any age. Even high schoolers will appreciate how simple this makes the complex subject of invertebrate taxonomy. 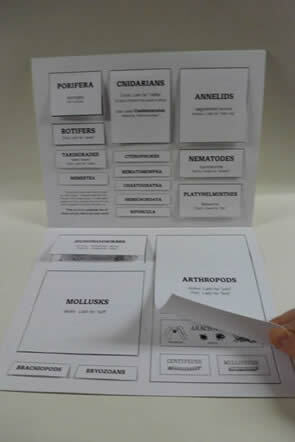 The chart can be a reference throughout a unit, then at the end of the unit the teacher can play some simple quiz games asking if anyone can remember which flap certain organisms are under. Guess first, then lift the flap to see if you were correct. We had great success with this in our classes. Time allowance: About 20 minutes for assembly, but maybe a bit more if the students will be cutting their own flaps. Here is an activity you can do with this chart. Download the picture file below and tape the pictures around the edge of the chart. 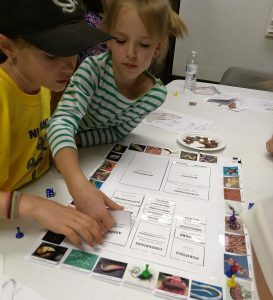 Players use dice to go around the “track” and every time they land on a creature they have to guess which flap it is under. More complete instructions included with the download link.